Enveloped. Usually rounded but can be filamentous. The virions are 80-120 nm in diameter. Viral RNA polymerase (PB1, PB2 and PA) transcribes one mRNA from each genome segment. Transcription is primed by cap snatching. mRNA are polyadenylated by the viral polymerase stuttering on a poly U track. NS mRNA can be alternatively spliced, giving rise to mRNA coding for NEP proteins. Polyprotein p42 is cleaved in M1 and CM2 proteins. Virus attaches to sialic acid receptor though HEF protein and is endocytosed by clathrins in the host cell. 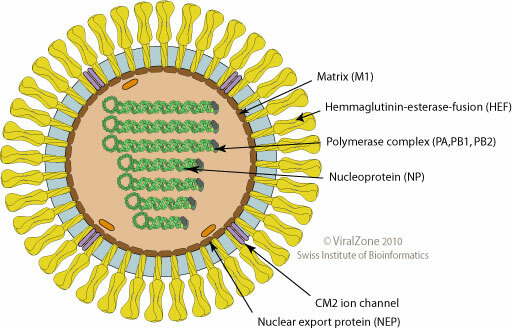 Influenza C virus inhibits the cascade leading to production of interferon-beta by targeting host RIG-I activation through NS1 protein.